With a few lower peaks under our belt on Saturday and a better wind forecast on Sunday we headed up Quandary Peak south of Breckenridge, CO. Largely blue skies with 30+ mph winds accompanied our climb up the standard, east ridge, route. The route was snow free until just below the summit, but mostly had decent steps already kicked in. A friendly climber from Mexico took our summit portrait before we decided to start back down. Heading down we shed layers at about the same rate as we’d put them on during the hike up. Along the flat part of the ridge we ran into a few locals. 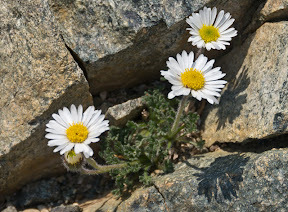 Besides seeing the mountain goats up close we were cheered by the thoughts of appetizers at the Quandary Grill just as soon as we could reach the car and drive the 15 minutes back to town. 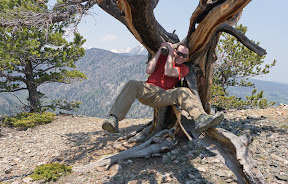 The forecast of 60+ mph winds up high kept Tara and I a bit lower than we’d hoped for a hike Saturday. We started with a quick hike from Frisco up to Mount Royal, about 10,500 feet. While the view was marred by the I-70 road corridor and some hazy skies, we still enjoyed the views down into Ten Mile Canyon. 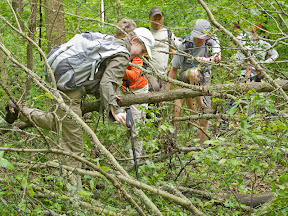 Following a brief snack we hiked and bushwhacked south towards the next bump on the ridge. 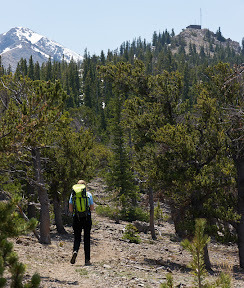 Portions of the trail were still under snow and sent us further west to find dry ground as we worked our way up another 1,200 feet towards Mount Victoria. While we had the windy summit to ourselves we saw some hikers had continued on to Peak One. Victoria would be our high point for today, and we still had to pick our way down talus and loose dirt back to the real trails and then roads that would take us to the Breckenridge Brewery for dinner. To kick off May weekends Tara and I got out for a 26 mile bike ride largely on the roads north and east of Boulder. Traveling to Indiana for work, I kept up some fitness by joining some spin classes at Indiana University’s rec center, attending a couple yoga classes (a first for me) and joining the Bloomington Hikers for a 12.5 mile, partially off-trail, loop hike through the Deam Wilderness. The light winter and warm spring made the vegetation seem thicker than normal for that time of year and an increasing number of blow-downs made following the old Blue Diamond trail harder than ever. I won’t even mention the poison ivy or ticks. 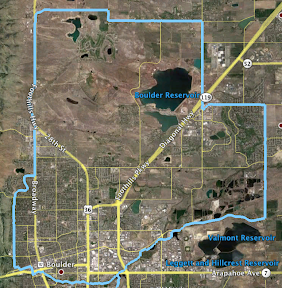 After returning to Boulder I was excited to get back on the bike, but not yet acclimated, so I settled for a 15+ mile loop taking in the Foothills bike path, Jay Road, 75th, Baseline, Cherryvale, Arapahoe and back to Foothills. 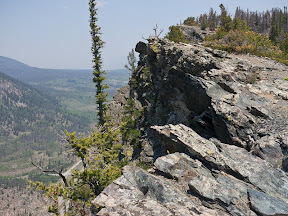 For the last weekend in April, Tara and I hiked the Walker Ranch loop with a start and finish from Eldorado State Park. At almost 14 miles and 4,000 feet of gain it was an excellent training hike. 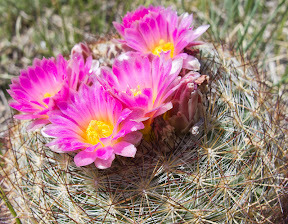 Besides a mess of mountain bikers we saw some blooming barrel cactus and a few snakes. 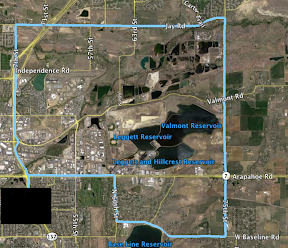 On Sunday I went for a 24 mile+ bike ride from Boulder out to Gunbarrel up to the Neva/Niwot roads and back on US36, 4th St and the Boulder Creek path. After recently having my bike fitted this ride felt so much better than a previous 30 mile ride that left me thinking I should walk the last few miles. Our combined training continued on Monday with a hike up Fern Canyon out of NCAR where we’d barely made it out of the parking lot before running into one pissed-off obstacle on the trail. 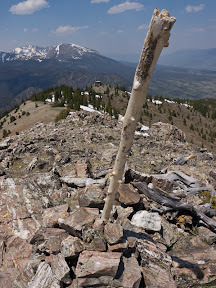 After working off-trail around the rattler we continued nearly to the summit of Bear Peak before deciding dinner was more important than the summit. 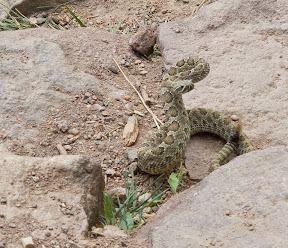 I spotted one final snake for the week two days later during a lunch bike ride up to NCAR and back – a route I’m going to need to do a lot more during lunch breaks to become a better hill climber.